This page introduces techniques to identify high frequency carbonate cycles or simple carbonate sequences. The technique involves using the bounding surfaces of the cycles and the lithologies they contain. These surfaces include erosion surfaces (SB) and the lithologies they bound that are those found in the carbonate cycles of the outcrops of Mallorca. The high frequency carbonate cycle can be considered to be the simplest of carbonate sequences. They form the basic carbonate accretional unit, in much the same way that the parasequence is often the basic unit of clastic sedimentary sections. The intent of this exercise is to establish the steps that should be taken to identify vertical sets of high frequency carbonate cycles within a measured section of shallow water carbonates and to interpret their depositional setting. The depositional models considered in the exercises are compatible with the conventional carbonate sequence stratigraphic models of Handford and Lucks, (1993), and Hunt and Tucker, (1993) while not, in the strictest sense, the clastic models of Van Wagoner et al, (1999). 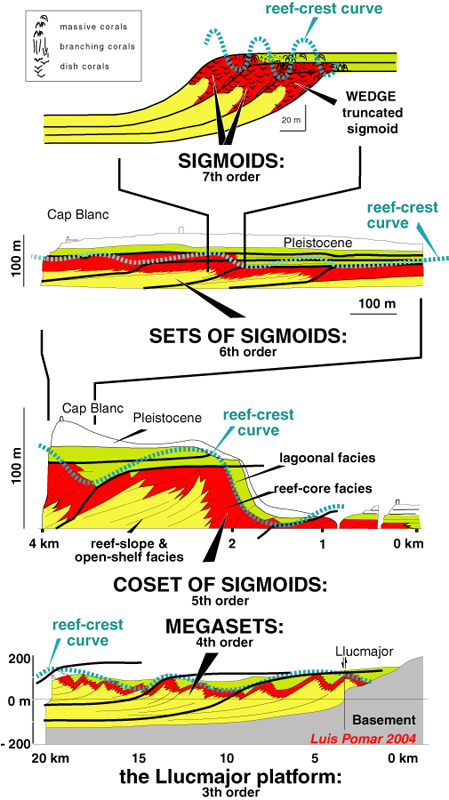 Unlike the parasequence, the high frequency carbonate cycles (simple sequences) and the allied basic reefal accretional unit used in the exercises, the sigmoid has no obvious marine flooding surfaces but are bounded by clear erosion surfaces (the product of sea level lowering and erosion with a matching correlative surface downdip). 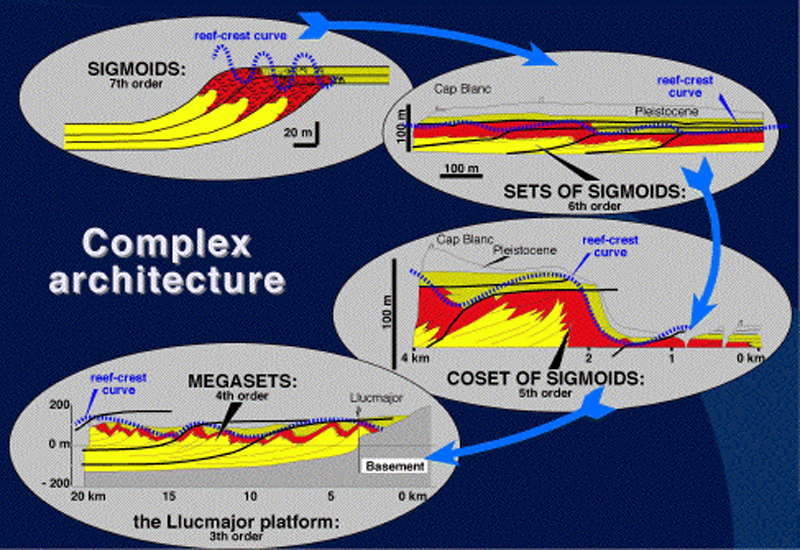 Never the less, these units and their associated sigmoid sets, and sigmoid cosets, match parasequence by being composed of a relatively conformable succession of genetically related beds or bedsets that lend themselves to process/product oriented types of analyses. Thus the geometric patterns exhibited by stacked sigmoids and high frequency carbonate cycles can be used as are the patterns of stacked parasequence sets, along with their position within a sequence, to define systems tracts. Despite this one could argue, and in many cases can demonstrate, that erosion surfaces bounding the sigmoid or high frequency carbonate cycle also involve the immediately following flooding event, and for this reason, though not strictly true, the parasequence can be considered to be equivalent to the sigmoid or cycle. We believe that this over simplification often leads to confusion and we argue against the use of the term parasequence in this and the exercises that follow! As explained in other exercise pages the data set of this exercise section and in the exercise sections that follow, exercises can be printed or imported into electronic media that include PC, Notebook, Tablet, or Pad. Using Power Point drawing tools in these electronic media is an effective and easy way to complete the objectives of the exercise and provides a means to collectively view of the results in class. Click on red box for more details in a separate tab. 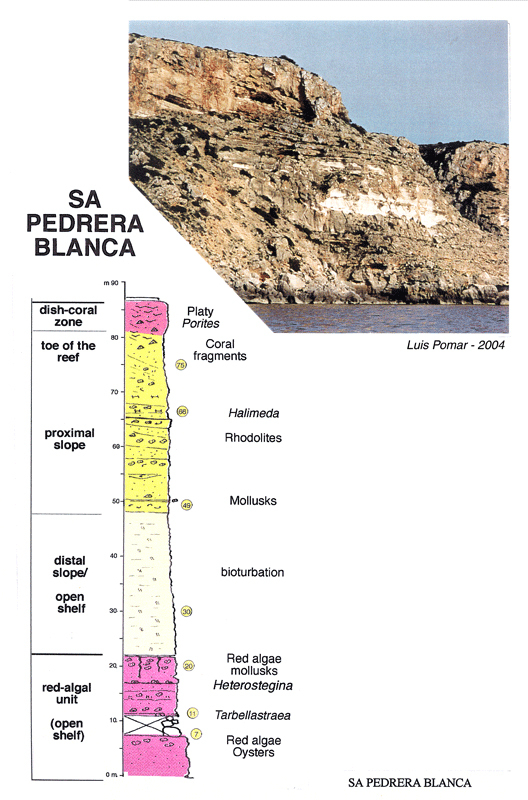 The San Pedrera Blanca section from the south eastern coast of Mallorca used in this exercise was previously described by Luis Pomar (1991). 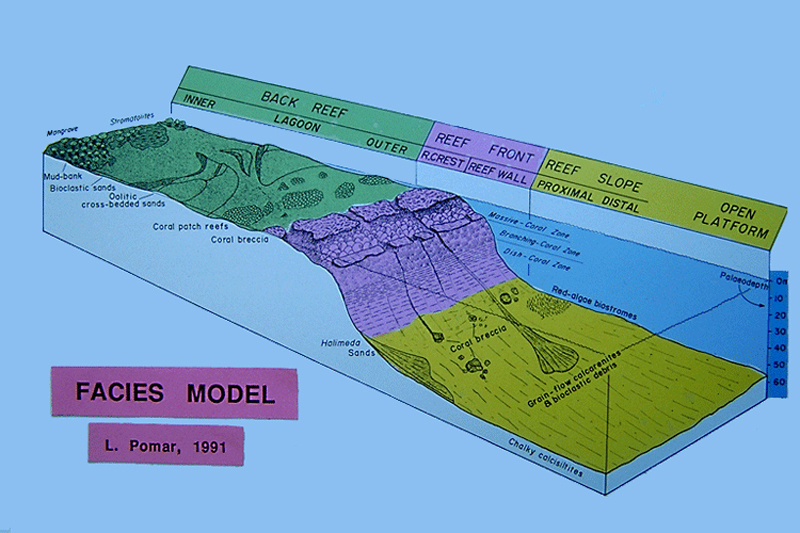 The secret to its interpretation is to cross check the section with the block diagram of the reef margin crest created by Pomar and Ward, (1999, 1994) displayed as thumbnails below to right, along with the associated linked diagrams and photographs of the vertical association of sedimentary structures, depositional systems in Baleariac Island Gallery accessible from roll over menu image above. You should also view the attached movie and read the earlier sections that introduce the geologic setting of the Late Miocene Llucmajor platform complex and its sequence stratigraphy. Click on the thumbnail below to view the movie that will enable you to recognize how important the erosion is that occurs when the shelf is subaerially exposed! Don't forget to use the left and right keyboard arrows to control the forward and backward motion of the movie so you can review this as you view it! 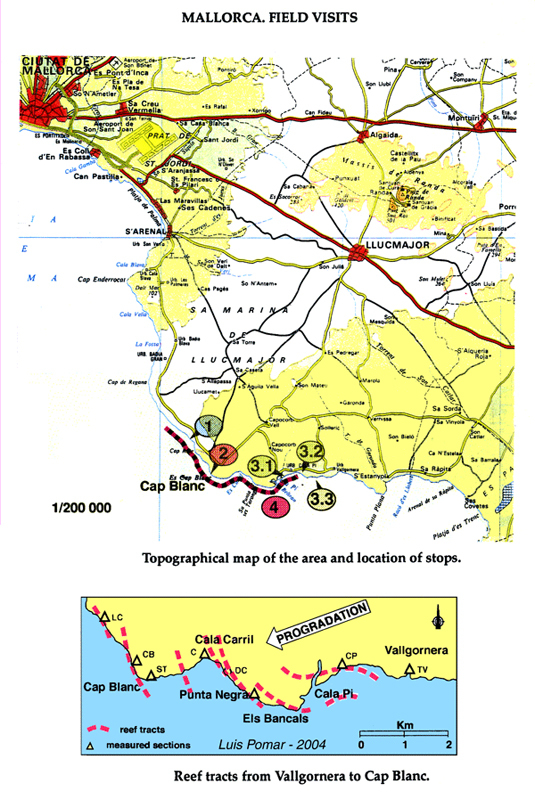 Using a combination of an understanding of the regional geology, and the vertical and lateral facies relationships in this near shore carbonate settings (e.g. the depositional setting of these rocks including lagoon, reef crest, downslope reef, distal slope and offshore shelf) and Walther's Law, you should build a depositional model of the measured section. A sequence stratigraphic interpretation of the area will be made later in Exercises 2 and 3 where geometric relationships play a greater role. 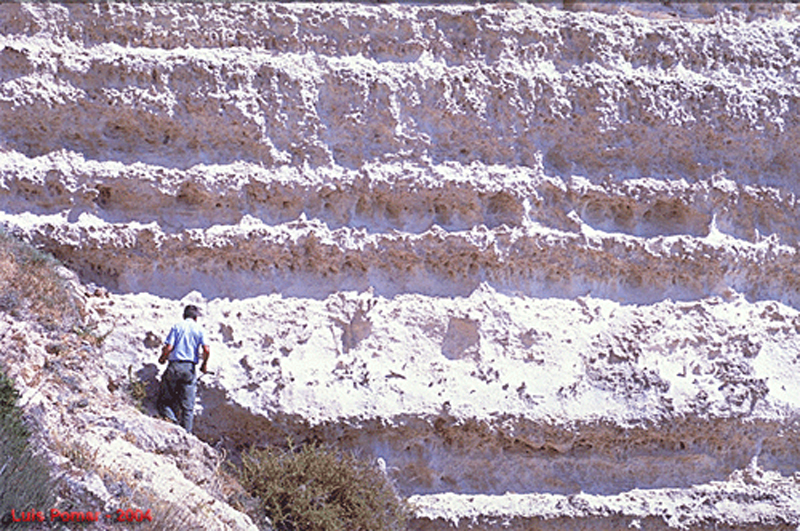 As you progress through the various exercises for the Late Miocene carbonate shelf margins of Mallorca you will see that erosion surfaces, or their correlative surfaces, represent the best means to separate this particular vertical association of facies types into packages of relatively conformable successions of genetically related beds or bedsets. These surfaces envelope the building blocks of the section including the high frequency carbonate cycles, sigmoid-sets and sigmoid-cosets of Pomar (1991). As Pomar indicated these erosion surfaces separate the younger strata above from older strata below. 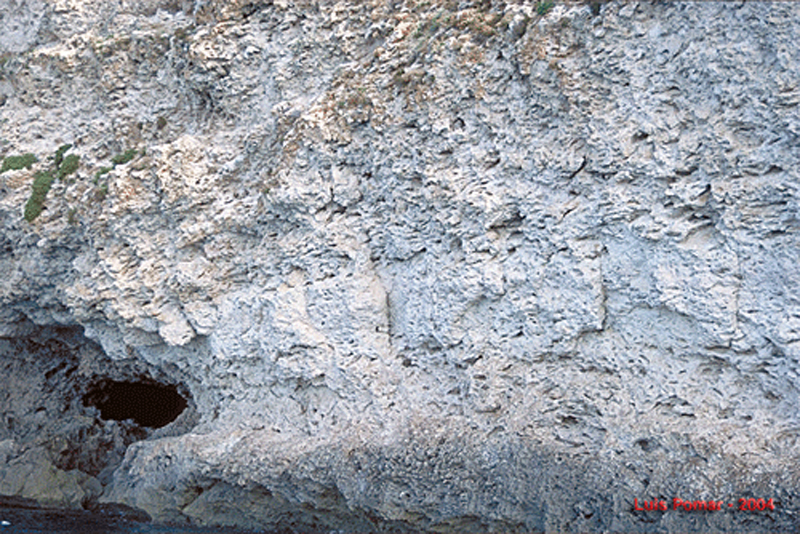 The surfaces also often show evidence of subaerial erosion over which an abrupt marine transgression and increase in water depth has been accompanied by minor submarine erosion and/or non-deposition, indicating minor hiatae. When you apply the techniques you have learnt in this exercise to other carbonate successions you may find differences. For instance you should realize that the sequence boundary surface can also often marks the boundary between the prograding highstand systems tract and the overlying of the transgressive systems tract. In carbonates the latter surface is also often characterized by the presence of hardgrounds and burrows, matching the underlying transgressive surface formed during or just after the initial transgressive phase that immediately follow sea level lowstands. 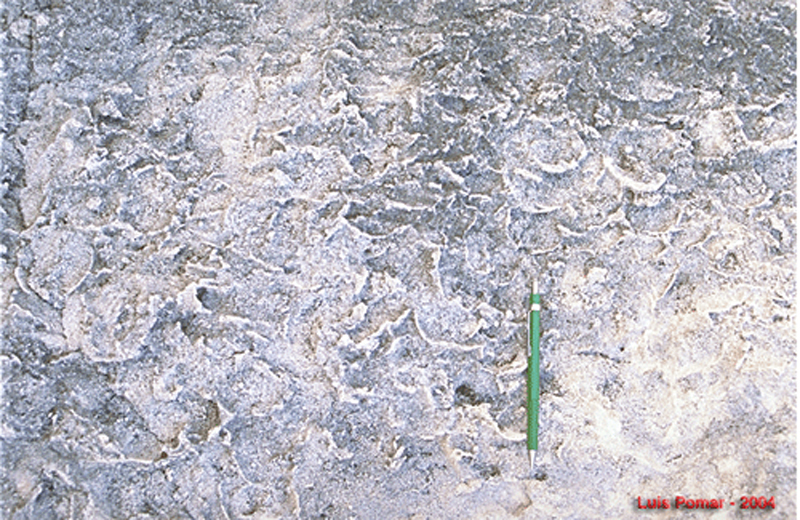 In some cases glossifungites burrows may occur within this surface and the surface may be cemented by carbonates. When these features occur you can use their associations to subdivide the sediments of measured section into their depositional settings. Identify high frequency carbonate cycles or simple sequences in the measured section. Examine the block diagram and the photographs that match hierarchies of sedimentary structures and depositional setting. 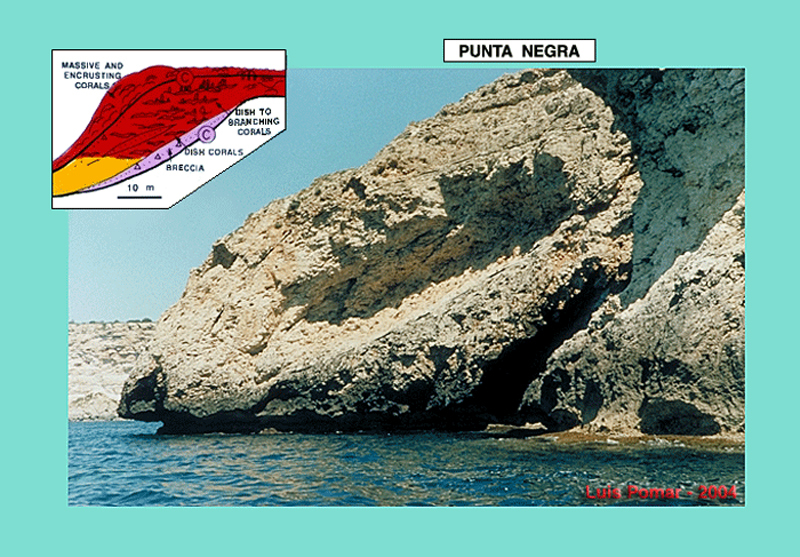 Check in the previous section that introduced you to the Late Miocene carbonates of Mallorca for the examples that Pomar and Ward (1990) provided of the fining upward parasequences of the lagoon; the crestal reef, reef slope, shelf slope and shelf basin. Identify erosion surfaces in the section provided for the Exercise and use these to separate the high frequency carbonate cycles from each other. 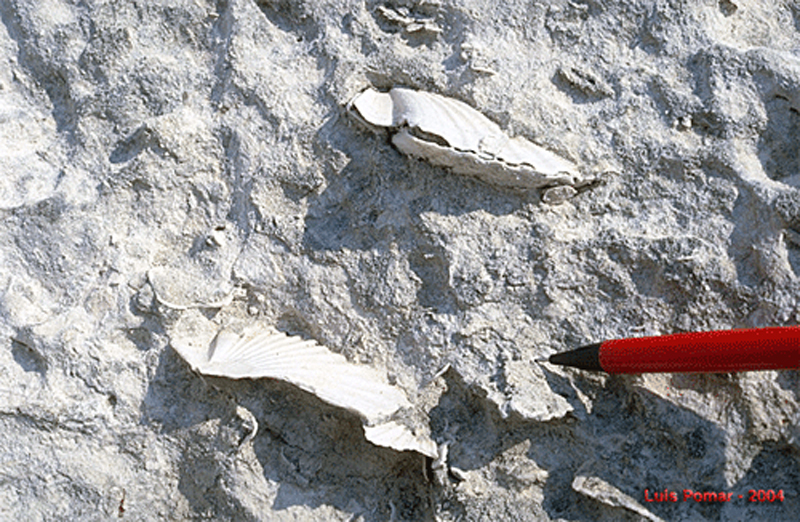 Use a combination of this subdivision, and abrupt changes in grain size with sedimentary structures to interpet the depositional setting of the cycles. Most sedimentary stratigraphers interpreting sections of carbonate rock are confronted with the problem of the difference in the sequence stratigraphy, facies architecture and boundaries of various Phanerozoic carbonate platforms. This is a reflection of diverse biotic systems producing differing products for the same processes. 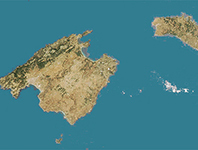 This can be seen when the distally steepened ramp of Menorca is compared to the reefal platform of Mallorca. 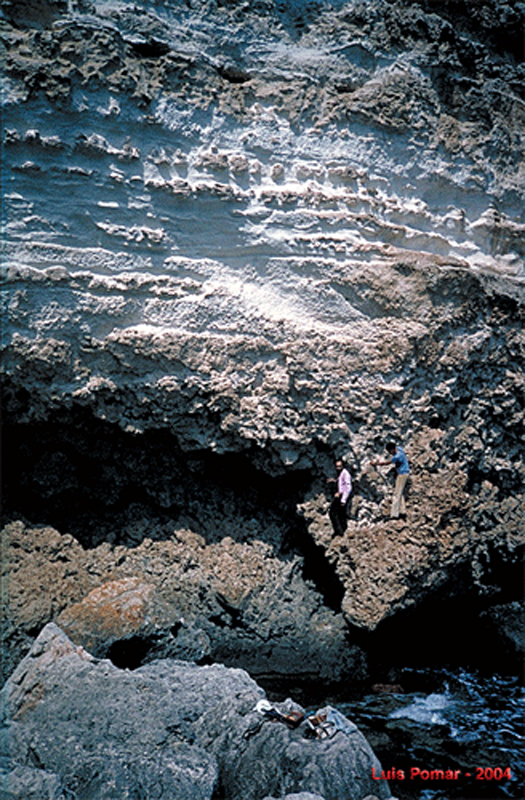 Although both these carbonate platforms were deposited during similar high-frequency sea-level fluctuations both have completely different architectures. For this reason, unlike the Late Miocene reefs of Mallorca (which match modern reef systems), often many shallow carbonate sections may contain maximum flooding surfaces (mfs) or transgressive surfaces (TS). Where these surfaces occur they may be used to identify and bound the parasequences since these surfaces are normally more extensive and so better correlation tools than the SB. Needless to say such surfaces are not the norm in the Late Miocene platform shelf of Mallorca. The movie above highlights the sequence boundaries (SB) so you can see why they are so important to this suite of rocks. 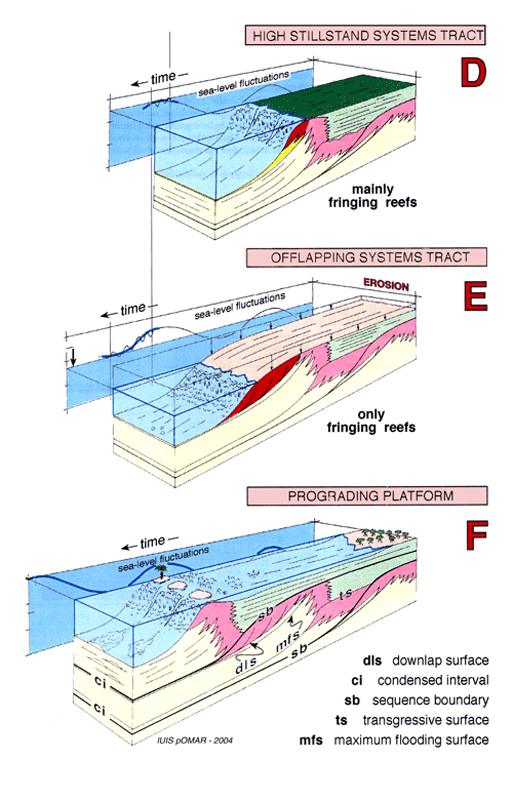 Thus in this exercise each high frequency cycle or simple sequence is identified by the sequence boundary (SB) which caps horizons and is equated with surfaces of erosion formed when sea level dropped below the section, and mark a sediment surface that was reworked when sea level rose following a sea level low. 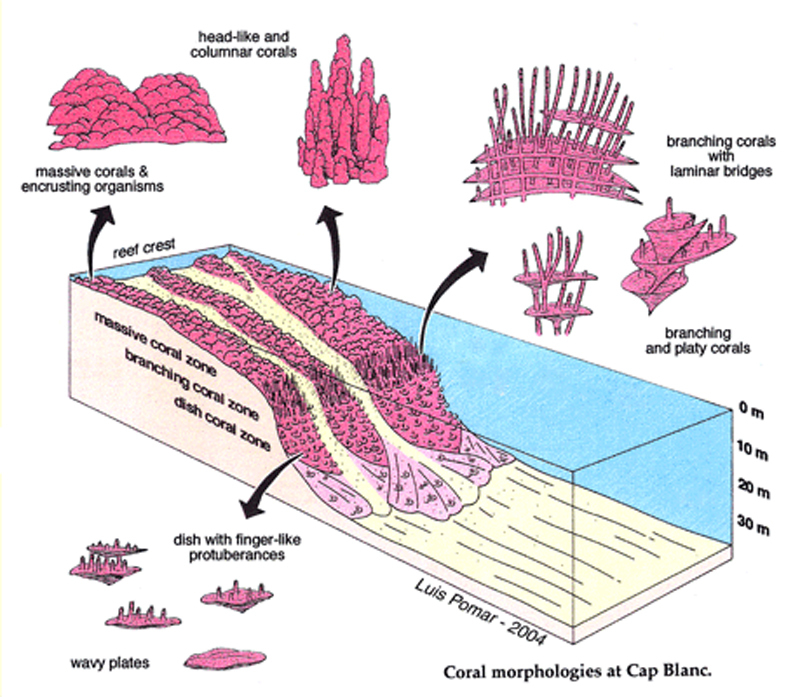 Your task will be to identify the base and top of the units of the carbonate cycle and identify the sequence boundaries (SB) at the top of the each cycle and identify these within the reef- or lagoonal section. 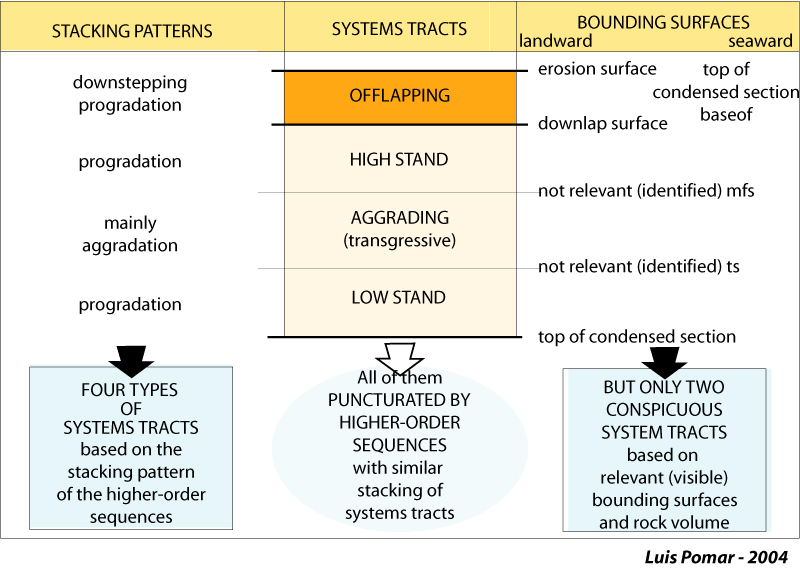 On the slope and open shelf facies, sequence boundaries are conformities and can be identified as condensed intervals. 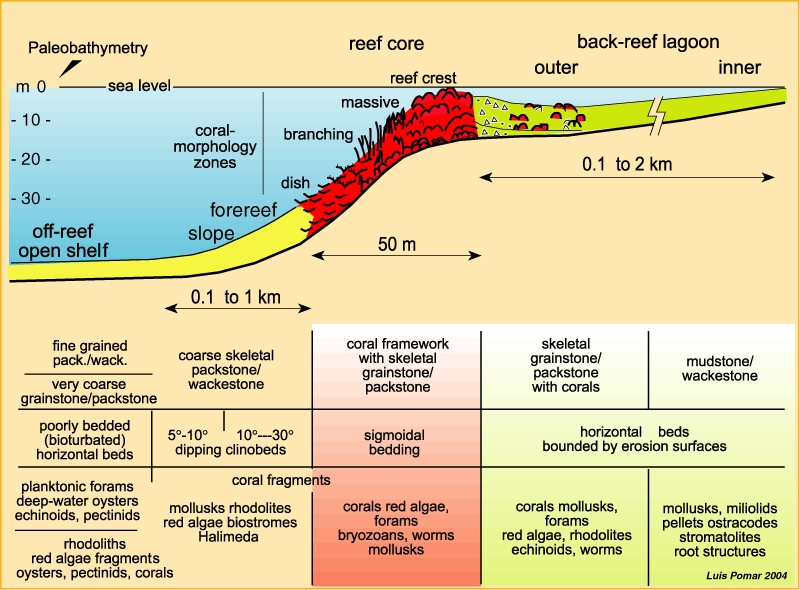 For example, scattered corals on photic (red algae dominated) open shelf/slope, represent the lowest position of the sea-level allowing good light to reach the sea floor and, consequently they mark the sequence boundary. 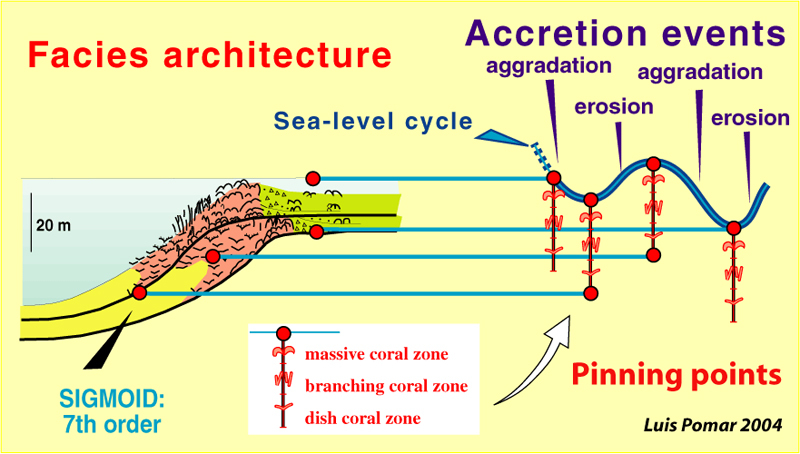 On proximal slope facies, rhodolithic-rich intervals represent "in-situ" carbonate production (by slowly growing red algae) in low-sedimentation rate area; low sedimentation rates on fore-reef slope areas only occur when the lagoonal areas do not shed sediment and this happens when the lagoon did not exist during fall of sea level and the platform-top was emergent. Use your examination of the block diagram to establish how the hierarchies of sedimentary structures match depositional setting. 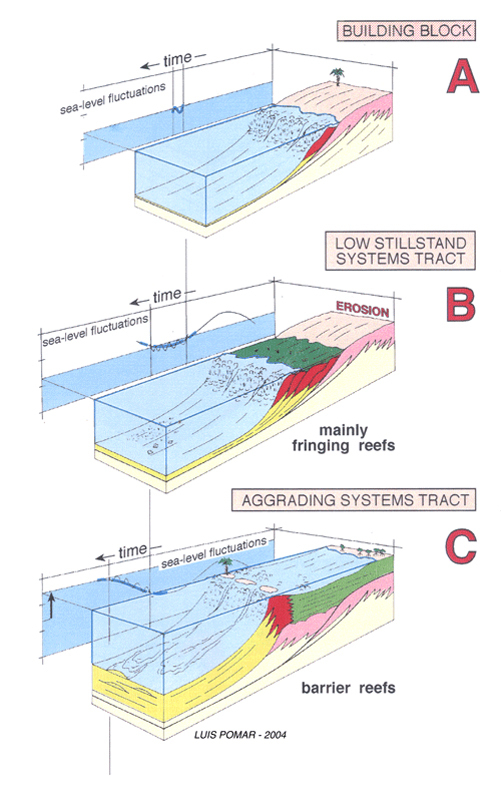 Use these associations to subdivide the sediments of the measured sections into their depositional settings. Now use a combination of this subdivision, erosion surfaces and condensed intervals to identify the sequence boundaries (surfaces of erosion) in the sections. Be sure to identify each of the high frequency carbonate cycle or simple carbonate sequence either with triangles that narrow in the direction of shallow water or arrows, so an arrow that moves to the left indicates that the water is becoming shallower. 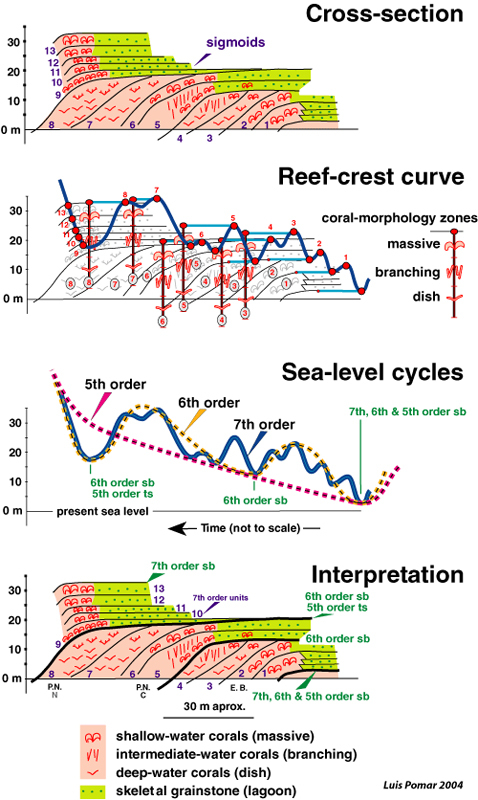 The high frequency cycles, or simple sequences, of the sections are represented by shoaling upward cycles bounded by an erosion surface followed by a reworked marine flooding surface. Thus the lower surface of each of the cycles is the base of the deeper lithofacies layer that overlies the top of a shallowing upward cycle. 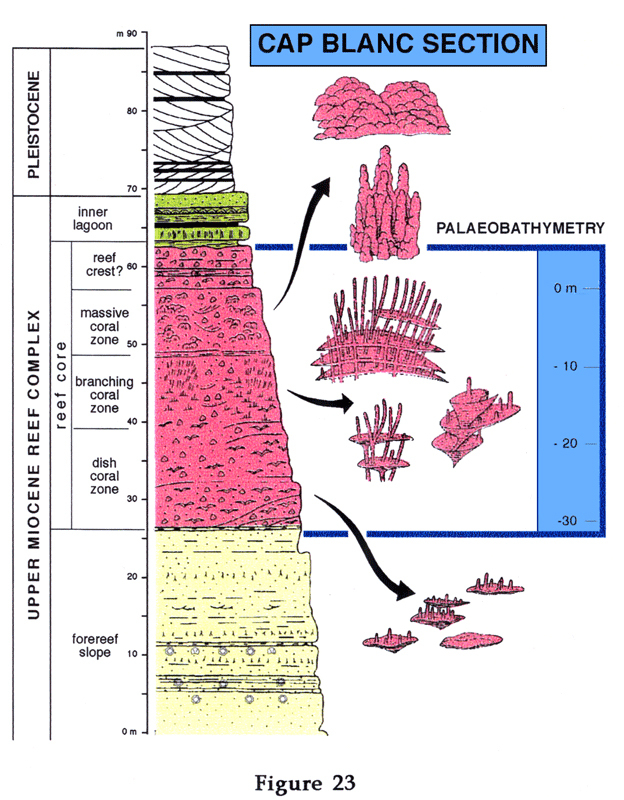 The upper boundary is the top of a shallower lithofacies layer that is overlain by a deeper lithofacies layer. Patterns of the stacking of the high frequency cycle sets or simple sequences are used in conjunction with boundaries and their position within a sequence like the parasequences of Van Wagoner et al., (1988) to define systems tracts.